A UNIQUE PRODUCT. A UNIQUE COMPANY. A UNIQUE STORY. 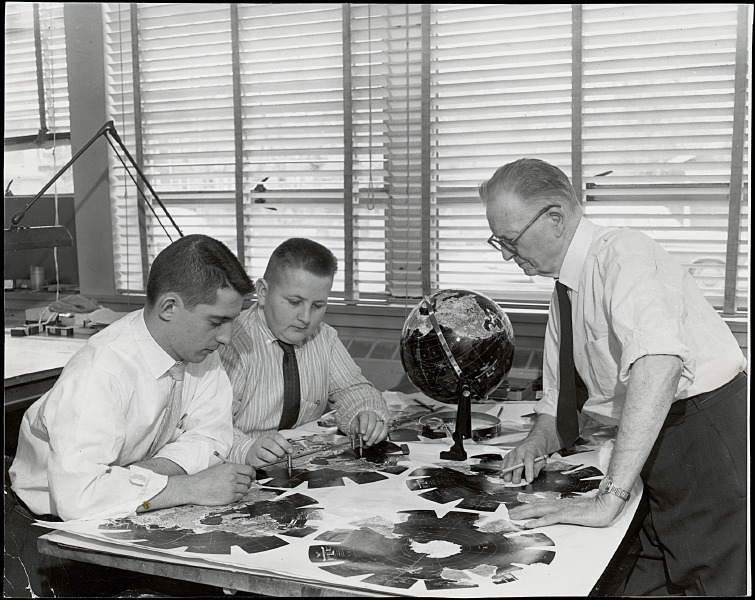 From its humble beginnings in a Chicago apartment, Replogle today is the world’s largest manufacturer of globes. From handcrafted masterpieces in the offices of presidents and dignitaries to classroom models that help students understand their world, our belief in the globe as a source of wonder hasn’t changed. Based in a 55,000 square foot facility outside of Chicago, most of our globes today are still painstakingly hand-made in the USA by artisans who have spent the better part of their lives with the company. This is indicative to a commitment to quality, doing things the right way and, most importantly, a commitment to the globe itself. Replogle’s mission is to deliver globes to an ever broader audience. That was the vision of Luther Replogle in 1930, and it is our mission to this day. We believe that the appeal of the globe is deeper than its value as a learning tool or home accessory. Luther knew this from the beginning. As a school supply salesman, he took a special interest in globes, believing he could successfully market them to a broader audience. Behind the rallying cry, “A Globe in Every Home,” Replogle facilitated the globes migration from the classroom to the living room, to every home. What began with hand-assembled globes sold from a Chicago apartment grew into what you might call a Global Empire. It is 1930. The 122 million citizens of the Unites States brace themselves for what will become known as the Great Depression. 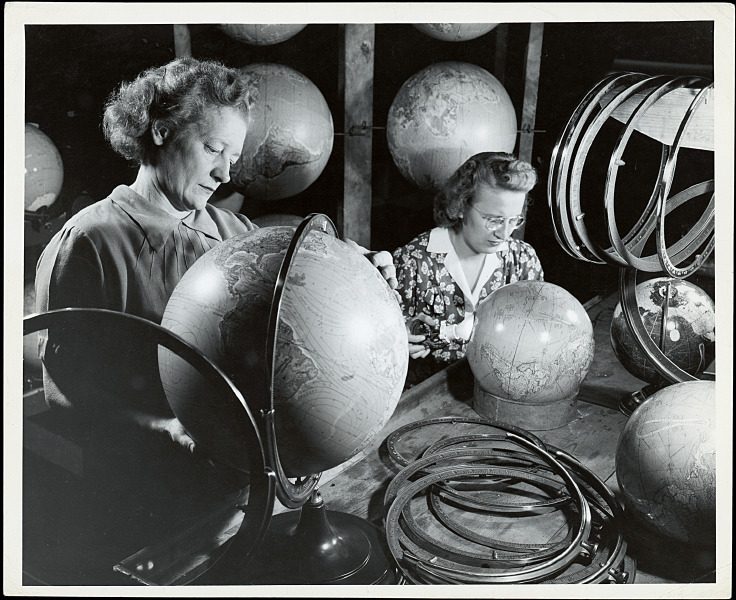 Undaunted, Luther Replogle and his wife, Elizabeth, begin assembling globes in their Chicago apartment. Luther’s idea – A Globe in Every Home – flies in the face of the dwindling economy, not to mention logic itself. Luther believed that the globe was too valuable, too beautiful to be forever relegated to classroom duty. Where he got this idea is anyone’s guess. When Luther wasn’t making sales calls for a school supply company, he spent his time in the Weber Costello plant, watching globe-makers at work, paying particular attention as they pasted hand-cut map gores to molded hemispheres. Luther’s interest in globes paid off, and in a constantly changing, seemingly shrinking world, his vision is more relevant today than ever. 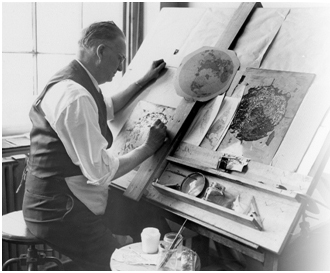 In 1930, Luther thought that a globe might help people make sense of their world. There were floods in the Mississippi River Delta, Fascism on the rise in Europe, and Lindbergh attempting to fly across the Atlantic. Replogle Globes has been committed to social responsibility since its inception in 1930. Today Replogle continues to use eco-conscious practices, material, and product for use in our daily production and business operations. All of Replogle’s “press-craft” globes are made from post-consumer reclaimed paper fiber, making over 75% of our total globe output eco-friendly. Recycling is one of the best ways to have a positive impact on the world in which we live. Replogle recycles approximately 340 tons of paper and fiber materials per year. Lean manufacturing can yield substantial environmental benefits and allows us to improve the quality of our products without increasing our Carbon Footprint. 99% of Replogle globes are hand-crafted in America. When you purchase a Replogle Globe, you are helping create jobs and opportunities for local communities. Replogle Globes takes pride and goes to great lengths to assure we provide you with the most accurate globes possible. The maps on all Replogle Globes show nations, colonies, possessions, boundary lines and place names as approved by the United States Government. Maintenance of the content of these maps requires frequent communication with the U.S. Department of State, The U.S. Board of Geographic Names, and the National Imagery and Mapping Agency. In addition to the sources mentioned, we communicate with embassies of other nations in Washington D.C. and foreign consulate offices in Chicago, our home base, for help with new changes in boundaries and names. We also use material from official foreign place-name agencies equivalent to our U.S. sources. In some regions we note political claims by neighboring nations, but the color(and border) is shown in accordance with the regions actual political affiliations or status. Similarly, we also show alternative or former place names in parentheses. This is one way our globes serve the needs of both the serious student and the casual user.